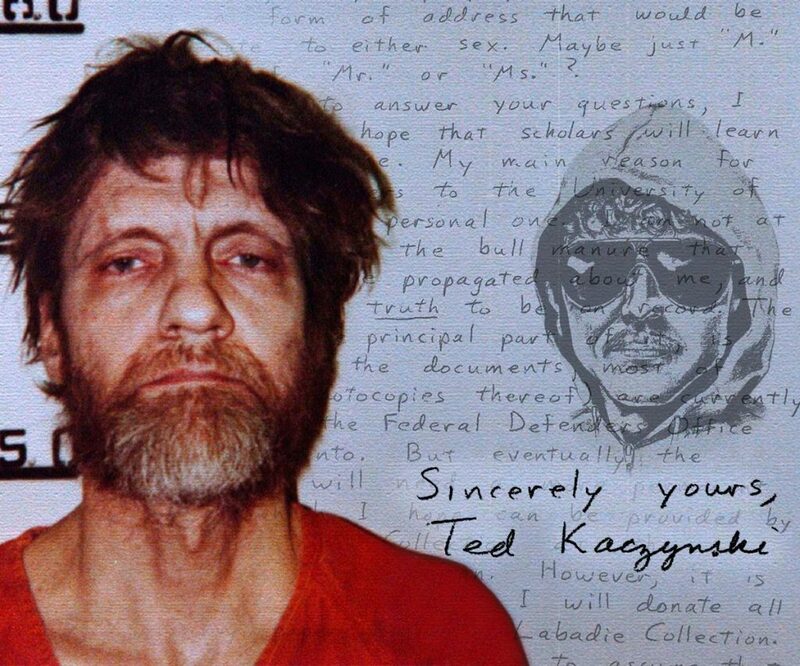 With Manhunt Unabomber on TV recently which I binged, I have been thinking about old Ted and his ideals behind the madness he was pushing. I would like to state up front that I do believe that Ted is clinically mentally ill and that manifested itself when he finally went into seclusion. What happened over the years that followed was an unbalanced reaction to ideas that have a core of truth though and many people actually see the same kernels of insight that I am going to talk about here. I have just finished re-reading the manifesto that he got the papers to publish under threat in 1995 and clipped some passages for you to see here without having to read the tome yourselves. Where I want to direct this post though is about the problems we have today with technology that Ted seemed to foresee and also to extend a little further into the social issues that we have seen played out in our recent election cycle and the probable attacks on the one upcoming in 2018. 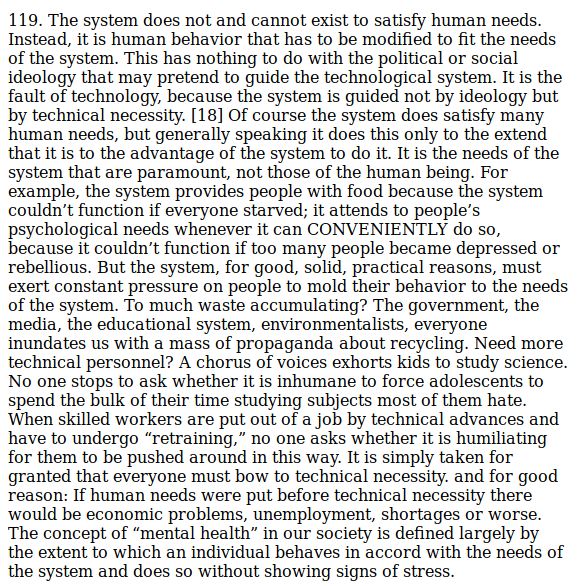 Ted touched on some of the sociological and more human issues of technologies and systems in his manifesto but for the most part he was taking a very rigid stance that all technology is bad for human beings and the environment. He had some interesting ideas on sociology specifically on left wing and right wing personalities and ideals that, well, he get’s all wrong frankly, but I feel it is important to mention. Though he got it wrong and his opinions on motivations was, well, very 1950’s, you can see some of what he is talking about in what has been playing out with the alt-right movement. Ted is misdiagnosing people’s motivations likely tinged with his own issues psychologically so his assessment is flawed. However, if you read above you can see something there if you align it to the alt-right today. They feel inferior in that they lack the power, or, lacked the power until Trump was put into power by their minority of thirty odd percent of the vote. Anyway, Ted goes on for a fair bit on this and I will not bore you with it as it is not overly germane to this post, but I thought you should at least get a glimpse here. Ted, you got leftists and right wing all wrong dude. Of course this was within the first pages of his manifesto and he really does not get to the technology part until section 114 or so where we want to be. 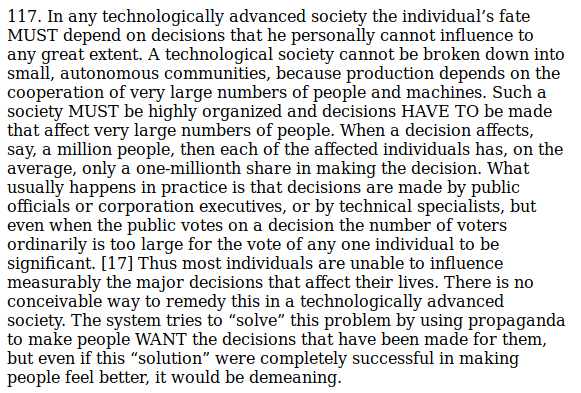 In 114 Ted starts to talk about “the system” which means all technologies to him I think, but if you look at it from the perspective of a political system as well, you can see something that maybe we all have felt. How many of you have thought about voting and come to the conclusion that your vote doesn’t count? I have, in fact in the last election I almost did not vote because I just felt that the system was rigged. In rigged I mean districts were gerrymandered, back door deals are all in play, and possibly even the election machines had been hacked because, as we all know in the security circle here, they are so weak in security mechanisms to be laughable to hack. In effect, these systems, both technological and rule based were inherently made untrustworthy by the system of politics. We have had our real autonomy and ability of action removed from us through the system and it’s rules …So why bother voting if it’s a foregone conclusion and there is no foreseeable change right? 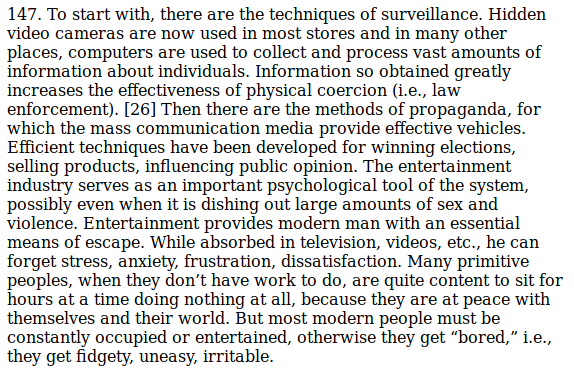 Another area of thought that Ted writes about that seems to be a companion to the above section is once again your power is taken from you because the government or the system. In Ted’s mind it is the technology at the bottom of all this but here again he is making what I would consider more a political or societal argument. In that conservatives really want states rights over big government, I for one cannot extricate this paragraph from the notion today that the right wing would like to take away the power of the people locally as well as nation wide even with “small government” Honestly some of their thought processes are rife with cognitive dissonance but the goals seem to be “we are in control because we have the money and the power and you should just do what we say” Anyway, it is just another system and technology today only enhances the control as far as I can see. Of course we are also seeing that with things like Anonymous and the internet, the power can be interrupted with the application of the right technologies as well huh? 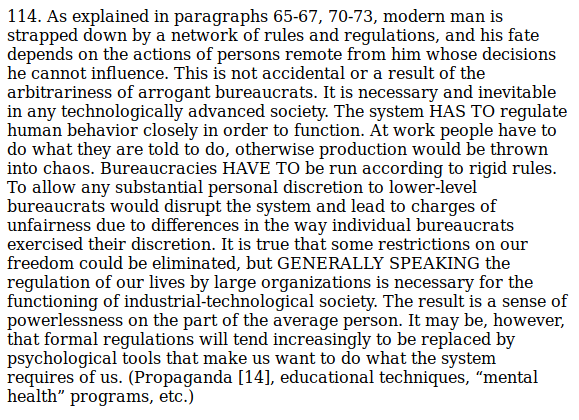 Here Ted is talking about the system taking over the individual to perpetuate the “system” and if you read this with an eye to today’s concerns over jobs and the rise of the Trumpists, you can see a parallel right? If the systems are now creating supply chains that are automated enough to not need human intervention for function, then we lose jobs right? Of course Trump really doesn’t cover this notion completely in favor of jingoism over borders and immigrants taking over our jobs but the real reality is that automation is doing this as well as tax games that move companies overseas. I sometimes wonder how the future will look if we do not educate our people better and these systems just function without the need for under educated workers, will we see more of this unrest that leads to another Trump? If you have seen Manhunt Unabomber, then you will recognize the imagery that they used at the end concerning free will and systems of control. Ted takes it to the nth degree but the reality is that systems do control our actions but once again you have to accept that control and accede to it to be controlled. The very core of hackers and hacking is the notion that we can subvert the systems to make them do things they were not meant to do right? 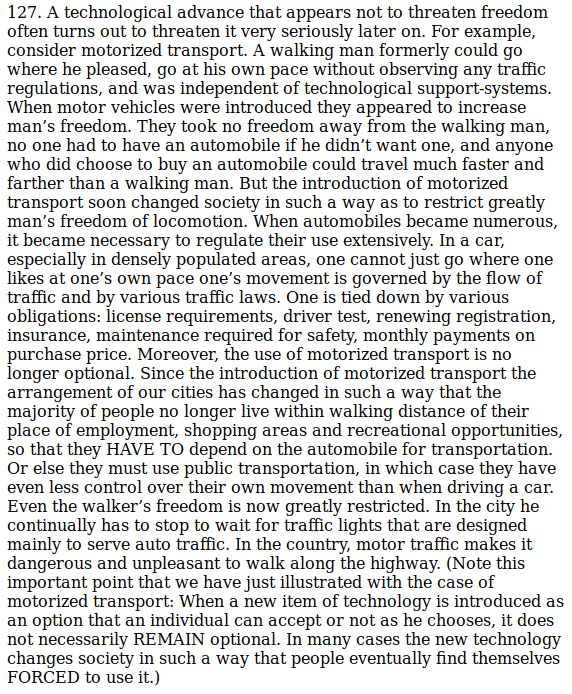 In the case of the stop light and the philosophical questions over being part of a system or controlled by one is very interesting. You all should ponder this as hackers and persons within a series of systems both technical and logical and consider your position here as well. I think we are at a cross roads here post 2016 and the use of technologies and systems of governance where one might feel like Ted a bit. What control do we really have when you could opt out of the system but the masses don’t? Look at what has happened when a small percentage of people in this country gamed the electoral system to elect Trump over the clear popular vote. The system has control over the lot of us and there isn’t very much we can do as we have seen if those in power, a small group, is in control of all our fates. It makes one have thoughts about hacking systems… What does it mean? Can it be done? Should it? Look at what played out in 2016 and then try to convince yourself that you can control the system enough to be immune. Geez I am starting to sound like Neo. Anyway, all of this manifesto reading has given me perspective on things in 2018. Ted had some ideas that are valid but he was unstable and decided to act on them to save humanity in the wrong way. Frankly he should have just lived in that cabin and kept to himself and paid no attention to the outside world. This is the crux of the problem though, could he? It seems like he lived on the fringes of society and he knew he could not go full mountain man and live off the land so he did what he did. Herein lies the problem though for us all. Unless you have the wherewithal to live fully off the land then you have to deal with technology and society right? So here we are, how many of you out there could just walk into the woods and live? I find it funny that a lot of our zombie shows pretty much deal with this issue and we are eating it up. Deep down we all know that if society broke down and technology stopped, we would have to fight for everything to survive. Many of us wouldn’t be able to handle it and there would be a lot of attrition. As we move forward with AI and more technologies that are supposed to make our lives easier, we are also infantilizing ourselves, separating ourselves from communities, and giving away certain aspects of ourselves to the machine. So I can understand some of what Ted was saying …I am just not mentally unstable enough to want to live in a shack and make little packages of explosives. I do however have my moments when I as; “What are we doing here?” I have written posts on Stratfor about hybrid warfare counter programs and honestly between the pervasiveness of the technology and the cognitive dissonance of those who use it I can see no good options for countering it. Is the answer then to just leave Twitter and Facebook? Is the answer to just not surf the net and read a book from a library? Or do you double down and work the system like a hacker and try to get some sanity? I don’t have a shack. I have a compound. Shielded within the system, up until the system decides that I’m a problem and they roll steel. I don’t kid myself, hell I don’t even roll encrypted. If the system wants it, they get it. You joke about Neo, but how about throwing in Avatar as well? When someone’s got something you want, you take it. The viral way. The rich do it through lawyers to landowners all the time. The incredibly rare Kelo resolutions are just candy for the kids. The sharks learn from it for next time. The system is a living institutional malevolent self centered glutton. Which is why we have things like the French revolution. When it spins out of control, we get change. Let’s hope they can keep it on the rails for once and get us all to the flying cars and enlightenment Star Trek civilization without going through the Troubles. Oh, look. Bitcoin is down.